When Leamington was incorporated as a village in 1876, it was a crossroads hamlet with about 300 residents and was known for its lumber products rather than its tomatoes. There were several docks, and fish were plentiful in Lake Erie… so much so that sturgeon could be speared from the shore and fish was about the cheapest food around. A settler named Peter Conover owned 170 acres along the shoreline and called it Seacliff Farm. He later set aside 20 acres and offered it to the municipality as a park. Surprisingly, his first offer was declined, but Leamington voters finally said “Yes” to Seacliff Park in 1907. The records are sketchy about when a hotel was first built nearby, but a clapboard structure named the Erie House existed before the turn of the century. It may have been destroyed by fire, but there’s no doubt that an establishment named the Dew Drop Inn arose near the docks and used to be a favourite haunt of sailors. The name was changed to the Bay View Hotel and finally to the Seacliffe Hotel, which reopened early in 1999 as a country inn with luxury rooms and distinguished dining. 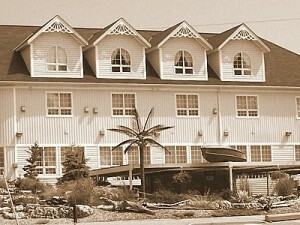 The Seacliffe Hotel continues a tradition of hospitality which dates back to the third bylaw passed by Leamington Council. This intriguing document states that tavern keeprs should provide their guests with “good and wholesome provisions and drink” and “not less than six clean and comfortable beds”. There also had to be stable space for at least 10 horses! One colourful description of the inn’s 1890’s attractions lists croquet outings as a magnet for the business and political leaders of the day. The account says, “There was always a beer fest on the lawn, which rolled right down to the lake, because the ‘suds’ sold for five cents a mug”. In the usual way of Essex County hostelries, the Seacliff went through regular transformations. An outdoor dancing area was one feature, and in the late 1930s there was a small expansion which added a Men’s Lounge and a lounge for Ladies and Escorts. In the late 1960s and early 1970’s, the Seacliff Hotel was a popular restaurant and dining establishment. The Towle Group, well known for its many diverse Essex County businesses, bought the hotel in 1986 and emphasized night club style entertainment and dining until closing it three years ago to start extensive renovations. There are legends of the hotel changing hands generations ago in bizarre way. One story is that it was won and lost in a poker game; another, that it was traded for a horse and buggy. No one knows for sure. Whatever.., the new Seacliffe Inn is once again a hospitality centre for Leamington and Essex County, and this keeps a long tradition going into the 21st Century. This article was written by Hal Sullivan for Windsor Life magazine.